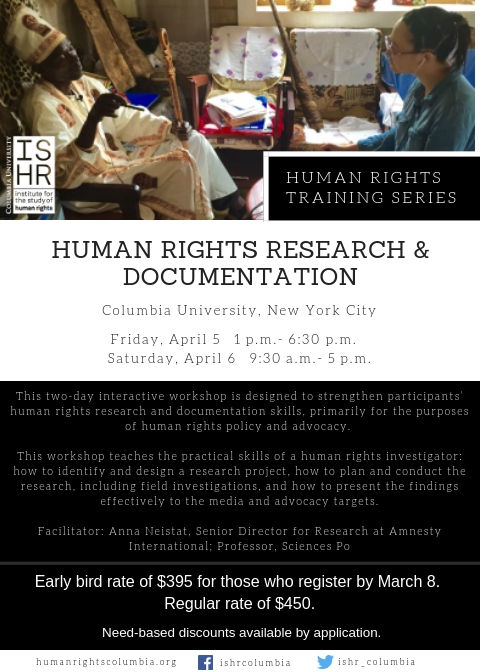 This two-day interactive workshop is designed to strengthen participants’ human rights research and documentation skills, primarily for the purposes of human rights policy and advocacy. This workshop teaches the practical skills of a human rights investigator: how to identify and design a research project, how to plan and conduct the research, including field investigations, and how to present the findings effectively to the media and advocacy targets. To register, visit the Columbia Calendar by clicking below.